Light Green SuperLEAF - 16oz. Shaker! The real color for early springtime tree and plant foliage. Has been used by experts for softwood trees such as Birch, Aspen and Linden/Basswoods. May also be used for leafy vegetable plants and early springtime ground coverings. Light Green SuperLEAF 24oz. ECO-Pak! The real color for early springtime tree and plant foliage. Has been used by experts for softwood trees such as Birch, Aspen and Linden/Basswoods. May also be used for leafy vegetable plants and early springtime ground coverings. Light Green SuperLEAF - 1 Gallon SuperPAK! The real color for early springtime tree and plant foliage. Has been used by experts for softwood trees such as Birch, Aspens and Lindens. Great for leafy vegetable plants and early springtime ground covering. Spring Green SuperLEAF! - 16 oz. Shaker -The real color for summer time tree and plant foliage. Has been used by experts for Sycamore, Poplar and Maple trees. May also be used for leafy vegetable plants and summer ground coverings. Spring Green SuperLEAF - 24oz. ECO-Pak ! The real color for summer time tree and plant foliage. Has been used by experts for Sycamore, Poplar and Maple trees. May also be used for leafy vegetable plants and summer ground coverings. Spring Green SuperLEAF 1-Gallon SuperPak! The real color for summer-time tree and plant foliage. Has been used by experts for Sycamore, Poplar and Maple trees. May also be used for leafy vegetable plants and summer ground coverings. Medium Green SuperLEAF 16 oz. Shaker! Medium green tone leaf excellent for black oaks and most eastern hardwood trees. Medium Green Tone SuperLEAF 24oz. ECO-Pak! A new dimensional styrene leaf flake used mainly for flocking trees including black oaks and many eastern hardwoods in an economical 24 oz. pack! Medium Green SuperLEAF 1-Gallon SuperPak! Medium green tone leaf excellent for black oaks and most eastern hardwood trees. Moss Green SuperLEAF - 16oz. Shaker - Excellent leaf coverage for evergreens, plants and bushes found growing in a variety of habitats including swamps, stream beds, North American as well as European deciduous forests. Moss Green SuperLEAF 24 oz. ECO-Pak! Excellent leaf coverage for evergreens, plants and bushes found growing in a variety of habitats including swamps, stream beds, North American as well as European deciduous forests! 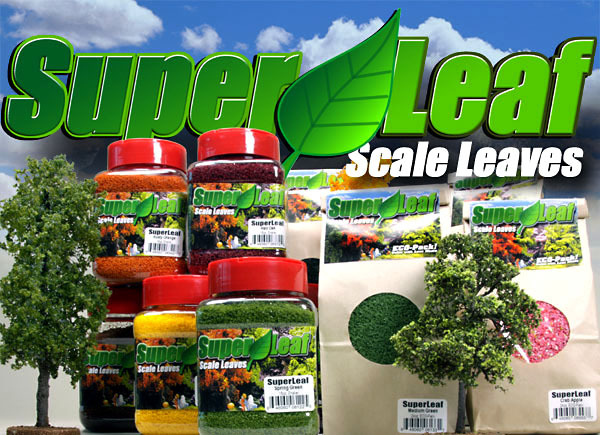 Moss Green SuperLEAF 1 Gallon SuperPak! Excellent leaf coverage for evergreens, plants and bushes found growing in a variety of habitats including swamps, stream beds, North American as well as European deciduous forests! Olive Green SuperLEAF 16oz. Shaker! Use to make any variety of late summer hardwood trees. Ideal for oaks, ash and cottonwoods. Available in a handy 16oz. (by volume) jar sealed with a plastic cap which provides two options for either spooning the leaves or shaking. Approximately 2 cups of leaves. Olive Green SuperLEAF 24oz. ECO-Pak! Use to make any variety of late summer hardwood trees! Now available in our NEW 24oz. (by volume) bag! Approximately 3 cups of leaves. Thats 8 oz. MORE for the same price! Olive SuperLEAF 1-Gallon SuperPak! Used for making any variety of late summer hardwood trees. Ideal tone for oaks, ash and cottonwoods. Now available in our 1-Gallon SuperPak! Ideal for those layouts in need of lots of premier leafy trees! Pale Green SuperLEAF 16oz. Shaker! Pale Green is ideal when just a touch of light green is needed for a highlight. Use Pale Green as a variegated plant or bush accent. Would also represent a healthy crop of vegetable plants!16oz. refillable jar (by volume). Pale Green SuperLEAF 24oz. ECO-Pak! Pale Green is ideal when just a touch of light green is needed for a highlight. Use Pale Green as a variegated plant or bush accent. Would also represent a healthy crop of vegetable plants! Now in our NEW 24oz. (by volume) ECO-Pak! Approximately 3 cups of leaves. Thats 8oz. MORE for the same price!